Jakarta may be for some people may feel a little hot and make claustrophobic. However, the city holds a unique variety of interesting attractions to visit. Here are some unique attractions for family and friends around Jakarta. Sea World is known as one of the places that have a fairly complete collection of fish. Although called Sea World, a collection of animals does not always contain marine animals, but also freshwater and estuarine animals. Many fish that may never ever seen can be found here. Such as sharks, piranhas, and mermaids. Unique place in Sea World is an ocean friends. In this pool, you do not need to fear holding marine animals such as turtles, sharks, and sea cucumbers. In fact, you can feed them. The pool is located not far from the main aquarium is usually the main centers of the visitors. Several types of sharks, turtles, rays, sea cucumbers and puffer fish inhabiting the pond is large enough. Do not be afraid first because of all the inhabitants of this pool is still young. Still an aggressive nature will only attack if only smell blood. Stingray tail has been cut toxic. While this type of puffer fish used is non-toxic pufferfish sand. So they are safe to handle, even lifted. Only turtles should not be held because always peck. One of the interesting sights here is the egg floating shark grouped at the bottom of the pool. Shaped flat and black on the edge. Egg yolks can be seen as a transparent shell. A few small sharks look like tadpoles swimming in the egg yolk. You are very lucky to be able to follow the feeding sessions to this cute animal. Animal feeding schedule is at 13:20, 10:00, and 17:00. The animals are usually fed fish and shrimp. For security and safety, you feed the animals use as food fish stick the smell of blood. During feeding, the guide will give some unique knowledge and information about the occupants of the pond. 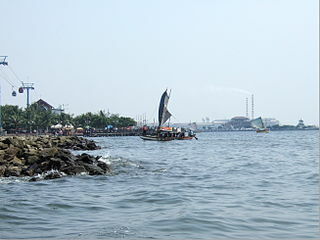 Sea World Indonesia is located on Jl Lodan East, Ancol. Want to race a car with friends and family? in Jakarta, the place is pretty much like a go-kart racing in karting Speedy hangar or Jewel. In addition to the pancoran, Speedy Karting also exist in Lippo Karawaci. Hangar is located beside Wisma Aldiron. Access to this place is quite easy and you also need to bring a car destined go kart from home. Before playing, you must use standard equipment such as a helmet, balaclava, gloves, and jackets. Gloves and headgear can you buy at the store fixtures go kart available here. While other equipment usually loaned. The crew of the Speedy Karting will provide direction on how to drive safely this mini car. if something happens during the circuit, simply raised both arms will help the crew had difficulty. Go kart is not just for adults, but also children. You can choose the appropriate cc. It could also drive a go-kart for two people. Go kart is suitable for couples who want to ride together. You are advised to play when the evening or early morning to avoid the hot sun. During the drive, you just need to play the gas pedal and brake. If you want a more toned, slightly turn the steering wheel when turning. Do not forget to comply with existing regulations for safety. Although only a game, the challenges in this circuit is the same as a real circuit. Every six months, usually the track will be modified so that visitors do not get bored. Go Kart Circuit in Jakarta, which can be found in the popular Hangar like Jl Gatot Subroto and Jl Pintu Besar Utara, Lippo Karawaci. If the hot air comes, people would want to swim and play water. Ocean Park is a water playground with a nautical theme that was built in serpong. You do not have to worry about a lot of crowded visitors because Ocean Park can accommodate 12 thousand people. However, to keep the atmosphere remains comfortable, Ocean park management limits the number of visitors is only about 7 thousand people. Entering an area of ​​8.5 hectares, you will be taken to the atmosphere of the beach area. The weather was hot at this place because the trees around a little and not shady. This condition is supportive atmosphere of the beach there. Supplied water rides in this water park like pool water splash town games, Slide n Fun, and lazy river Caribbean. Best main attraction arena you should try is the Pacific Wave complete with a replica of a pirate ship. Each one-hour, waves of 1.5 meters will be rolled travelers who plays in cola mini. This waves more often than any other water park is usually only operates two hours. Atmosphere more exciting because the waves will shake up visitors for 15 minutes. Wave shape also vary depending on the character of a visitor who was swimming in this arena. you do not need to wait for the appearance of waves because usually the siren will sound and it means the waves will start soon. If still not satisfied, let alone play slide n fun. Your adrenaline will be racing when the spiral slide the slider body with a length 96 meters and a height of 15 meters. You can also try race with racer slide in the slide. The trajectory shape is straight and has four lanes. Very exciting when race with friends and family. Excitement will continue as landing on Lagoon The Bahamas. Besides being able to swim, you can feel the sensation of relaxing massage when try to ride waterfalls. Having tired of playing the water, you can eat at Fisherman’s Village is located near the Pacific Wave or The Plaza, near the exit. Safety is also guaranteed because of the attractions in each vehicle manned by a lifeguard. Ocean Park Water Adventure is located in the CBD area, BSD City. Water games complex are open every day.